any addition, modification, or deletion of items in the base table, any indexes on that table are also updated to reflect these changes. DynamoDB creates and maintains indexes for the primary key attributes for efficient access of data in the table, which allows applications to quickly retrieve data by specifying primary key values. Global Secondary Indexes (GSI) are indexes that contain partition or composite partition-and-sort keys that can be different from the keys in the table on which the index is based. 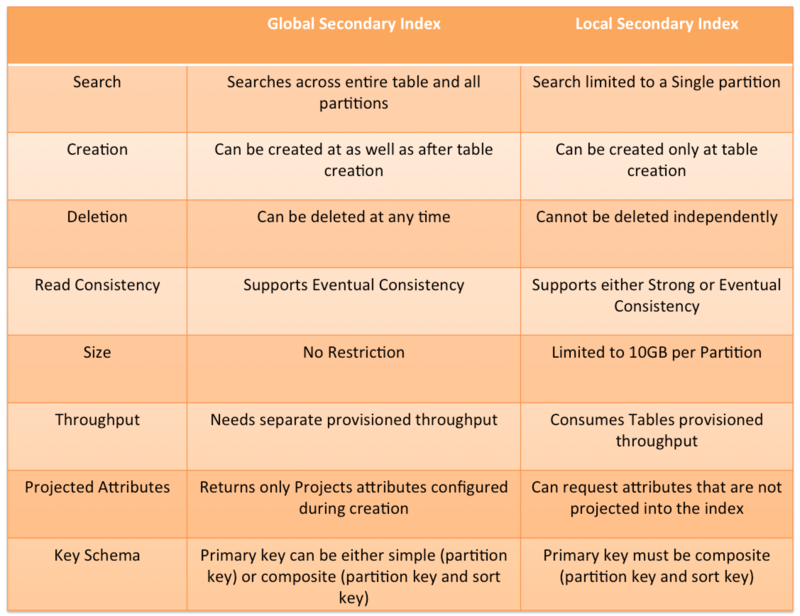 Global secondary index is considered “global” because queries on the index can span all items in a table, across all partitions. Multiple secondary indexes can be created on a table, and queries issued against these indexes. Applications benefit from having one or more secondary keys available to allow efficient access to data with attributes other than the primary key. Data in a secondary index consists of GSI alternate key, primary key and attributes that are projected, or copied, from the table into the index. provides one Read Capacity Unit with two eventually consistent reads per second for items < 4KB in size. provides one Write Capacity Unit with one write per second for items < 1KB in size. Local secondary index are indexes that has the same partition key as the table, but a different sort key. Local secondary index is “local” cause every partition of a local secondary index is scoped to a table partition that has the same partition key. The partition key and sort key can be different from the table. Only the partition key can be different from the table. Either the partition key or the sort key can be different from the table, but not both. Only the sort key can be different from the table. 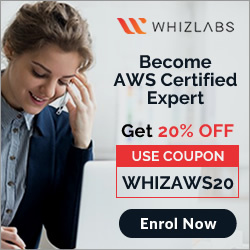 Is this for AWS SA or Pro? 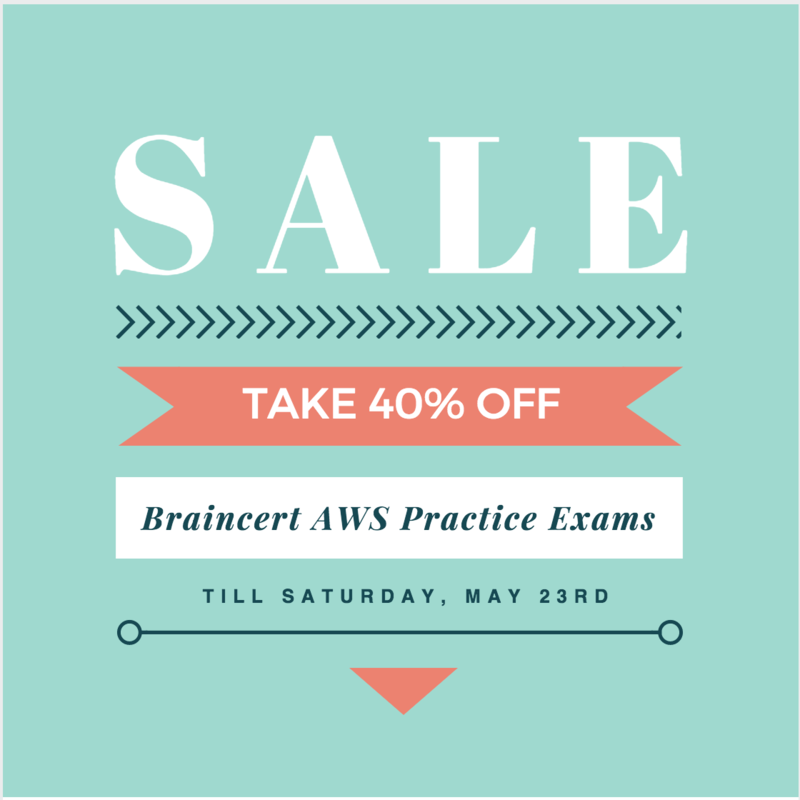 Am working on my AWS SA and seems this is a bit in depth. This is mainly for Professional, but its better to understand the difference between a local and secondary index. now doing developer exam today. Is there any restriction on the number of Global and Local secondary index? Hi Sandip, You can define a maximum of 5 local secondary indexes and 5 global secondary indexes per table. Yes, if it is a local secondary index. do u get some clarification here from someone? Thats right Hina, AWS now allows you to modify global secondary indexes after creation. Update the answer. i don’t think you can have the same key as hash and range.